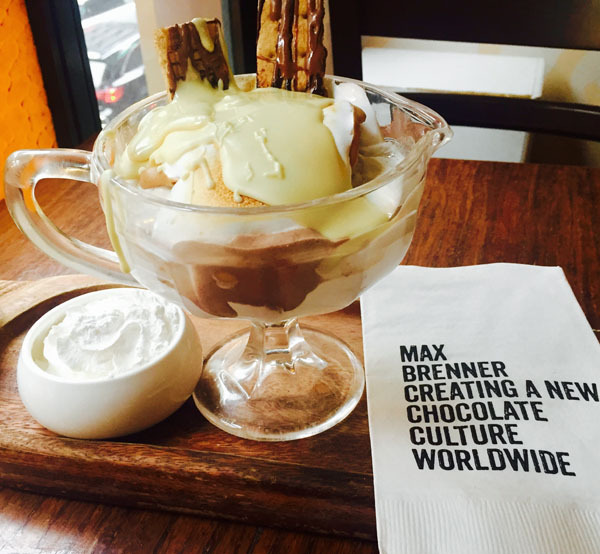 Internationally recognized superstar chocolate bar restaurant Max Brenner: Chocolate by the Bald Man has attracted swarms of tourists at the ideally located Union Square restaurant in New York. Sending everyone into a sugar load is the norm at this fine establishment, where all your Willy Wonka and The Chocolate Factory dreams come to life—minus the Oompa Loompas. Nevertheless, this chocolate coated, heavenly defined establishment is set to deliver. The new summer menu that was recently introduced, can only be described as sweet and sugary, with a hint of spice—I will let you know where the spice comes in. Trust me it’s not to be missed. June 6, marked National Churro Day—a very enjoyable day of the year, I might add. 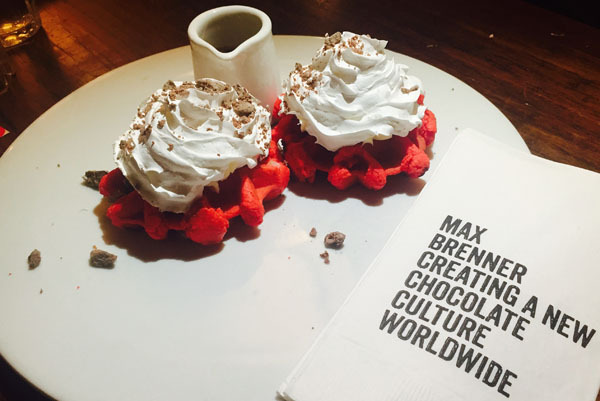 On this day Max Brenner served up the newest additions to their already sweet filled menu. First on the menu is the crystal churros fondue, which consists of homemade churros, served with muddled raspberry sauce and of course your choice of milk, dark or white chocolate fondue for dipping. What are churros without the fondue right? Next came the mother of all desserts, the Churro-Taco Waffle—yes I said Taco Waffle. 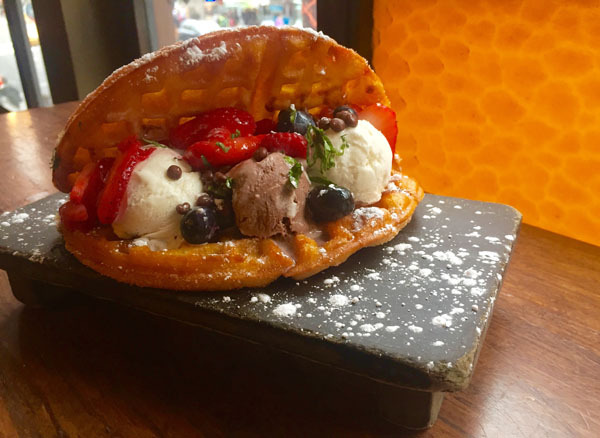 This beast consists of home-made waffles, deep fried and rolled in sugar and cinnamon, drizzled with chocolate sauce, filled with vanilla and chocolate ice cream. If that wasn’t enough this dessert creature is topped with mixed berries, choco-pops and mint and served with a flask of milk chocolate ganache. If you’re having trouble swallowing that, you can wash it down with the heavenly chocolate martini, that has just the right balance of chocolate and martini. There’s a saying—sugar, spice and everything nice. This could not be more accurate to describe the Cocoa Spiced Waffle Fries. Crispy golden waffle fries, coated in a light cocoa spice served with honey mustard dipping sauce, is more than you could ever want from a potato. This small appetizer is perfect for a break in between the waterfalls of chocolate consumed. 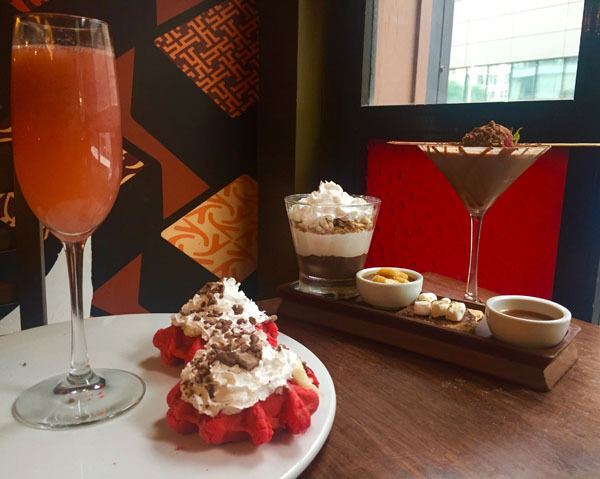 The red velvet waffles are strawberry sugar flavoured waffles, topped with whipped cream and served with a flask of chocolate sauce. This great dessert has an even better cause as all the proceeds from EAT (RED) dishes go to the global fund to fight HIV/AIDS worldwide. To finish it off, the strawberry is a must for a light refreshing cleanse after lavishing in sweet chocolate goodness.